Microchip’s RN52 Bluetooth audio module delivers high quality audio in small form factor (26.0 mm x 13.5 mm x 2.7 mm). The module combines a class 2 Bluetooth radio and an embedded DSP processor, controlled and configured by simple ASCII commands. Learn more from the vendor’s datasheet. DSP, or digital signal processor, is what makes this module special, because it can actually stream audio – it converts and compresses the radio waves sent from your phone or computer into digital data, and then sends it to your speakers or headphones. As a use case example, we built a multimedia station project. Read about it in this tutorial. The module supports aptX, audio codec for high quality stereo audio streaming over a Bluetooth connection. So the quality of the sound is not something you will have to compromise on, as aptX encodes a CD-quality (16-bit / 44.1kHz) audio stream. The RN52 module supports HSP/HFP, A2DP, AVRCP and SPP, as well as digital I/O, stereo speaker output, stereo microphone input. The module also supports iAP profile discovery for connecting the BT Audio click to Apple devices like, iPods, iPhones or MAC computers. HSP/HFP stands for Hands-Free Profile and Headset Profile for an audio connection between Bluetooth on your phone and the headset. 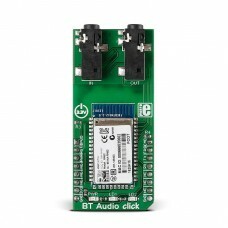 BT Audio click has a 10m range in open space. The range is smaller indoors, but still enough to cover a few rooms. 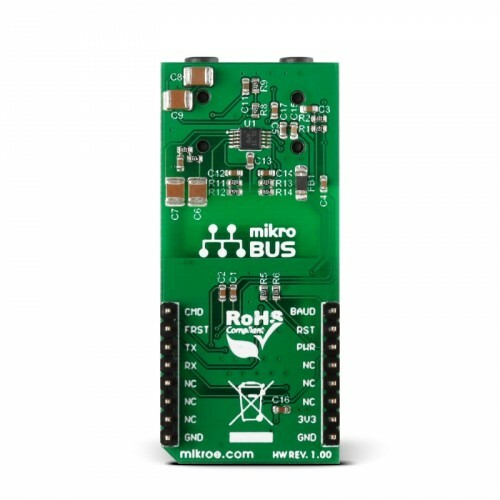 BT Audio click communicates with the target board MCU through the mikroBUS™ UART interfaces, with few additional pins. 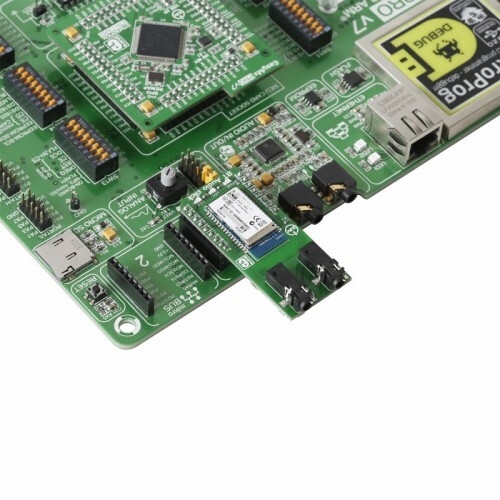 The board uses a 3.3V power supply only. Applications Wireless audio docking stations, wireless speakers and headphones, smart medical devices, VoIP handsets, intercom push-to-talk audio connection, etc. This table shows how the pinout on BT Audio click corresponds to the pinout on the mikroBUS™ socket. The module also supports iAP profile discovery for connecting BT Audio click to Apple devices like iPods, iPhones or MAC computers. The RN52 supports HSP/HFP, A2DP, AVRCP and SPP, as well as digital I/O, stereo speaker output, stereo microphone input,up to 11 General Purpose I/O’s, and 2 LED status outputs. The HSP/HFP stands for Hands-Free Profile and Headset Profile for an audio connection between Bluetooth on your phone and the headset. 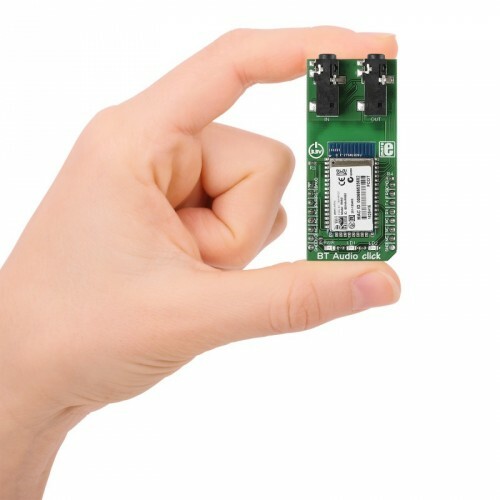 The module is fully Bluetooth qualified and provides global modular approval. The ADC can sample up to 200 kHz using different inputs as sample triggers and it supports 8/10/12 bit resolution. Any of the 8 analog inputs can be used both as single-ended inputs and as differential pairs for measuring the voltage across them. The ADC supports full 0 V to VCC input range. 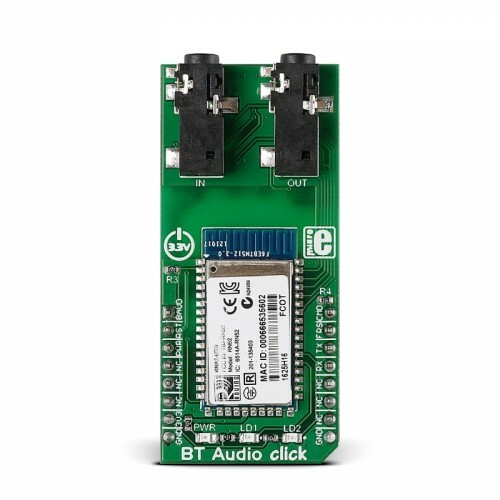 The BT Audio click runs on 3.3V power supply only. The demo is a GUI application made for the mikromedia+ for STM32F7 with a shield. The Application uses BT Audio library to interface between the touch screen and click board to play music and make phone calls.